Johnny Depp’s Best — And Worst — Onscreen Moments. | The Cineaste's Lament. ← Paddington To Finally Come To The Big Screen. Johnny Depp’s Best — And Worst — Onscreen Moments. With director Tim Burton’s reboot of the 1960s horror soap “Dark Shadows” about to debut on domestic screens, TotalFilm takes a look at the filmography of Johnny Depp, who plays vampire Barnabas Collins in the feature. 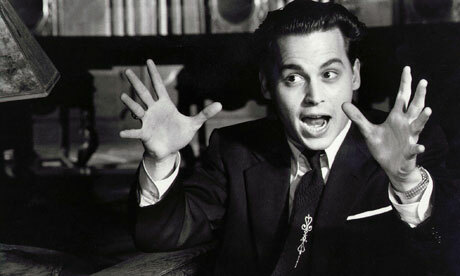 Depp’s best, big screen star turn comes in the 1994 biopic (and one of my favorite movies of all time) “Ed Wood,” where Depp plays the 1950s schlockmeister with a manic energy and infectious enthusiasm. Again a Burton vehicle, it’s a love-letter to the 1950s and the B-Movies that no doubt shaped the director’s own sensibilities. This entry was posted in Film News, Listomania and tagged Angelina Jolie, Ed Wood, Edward Scissorhands, Johnny Depp, Johnny Depp's best onscreen moments, Martin Landau, The Tourist. Bookmark the permalink.